Brought to you by Nuffnang and EasiYo. All opinions are absolutely my own! I love when I receive an email asking if I'd be interested in product testing something. It's fun, but most of all it lets me try something out that I may otherwise have not known about, and give my opinion. And today's product review is no different. The original was first developed about 20 years ago apparently ... boy that makes me feel old! I'll admit that I bought the original EasiYo many years ago, and I've used it on and off over that time, but it has been a while I'll confess. Why ... well, I don't really know. I mean homemade yoghurt ... who can go wrong with that, huh! And I'd forgotten how quick it really is to do. You just grab your 1 kg jar that comes with the yoghurt maker, (the one on the left is the old version ... how much prettier is the new one!! ), fill it half full with room temperature water, add your yoghurt sachet, then put the lid on and shake. 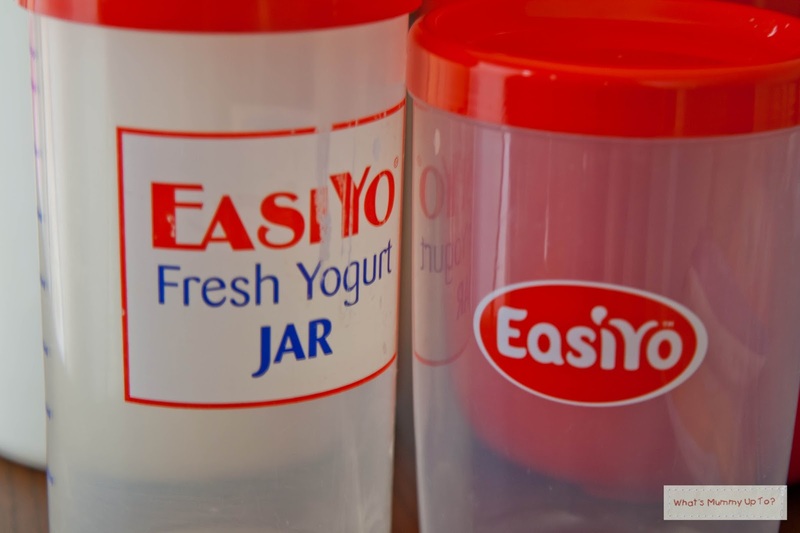 Then you fill the jar the rest of the way to the top, another little shake and pop it in the yoghurt maker that's been filled to the level marked inside with boiling water. 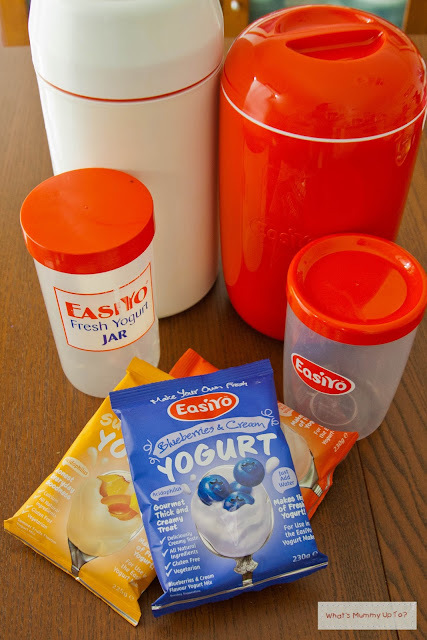 You put the lid on, and in 8 hours ... fresh yoghurt, ready to go. 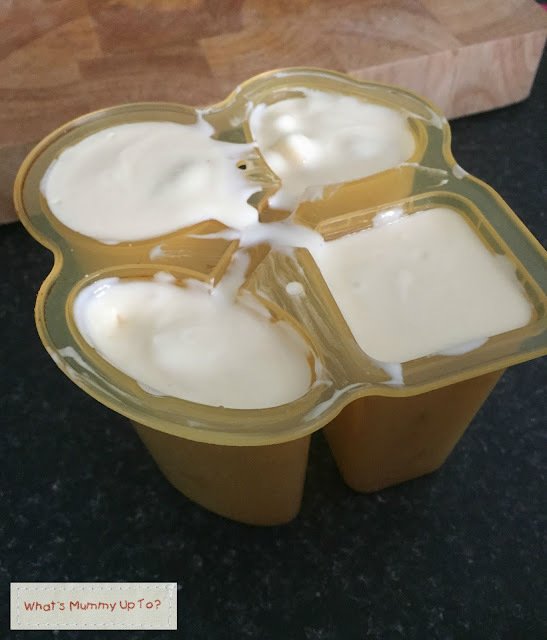 And apparently the longer you leave the yoghurt in the maker, the thicker it becomes and it's safe to leave it in there for up to 24 hours. 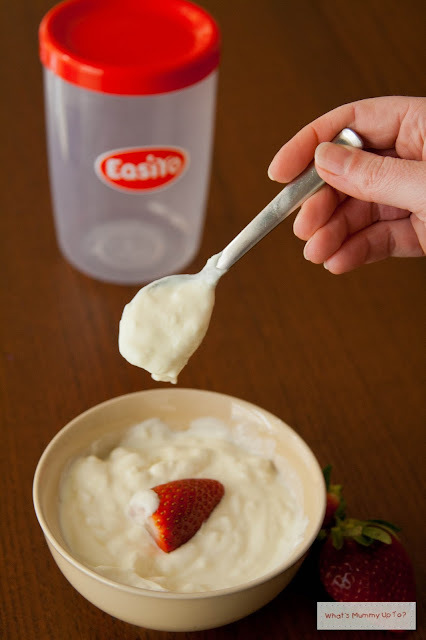 I have done mine overnight each time, and the yoghurt is a beautiful consistency... oh, and I've been told that the probiotics in yoghurt are at their most potent when it's freshly made, so there's another reason to make it at home. So, the flavours ... I was lucky enough to be able to sample a bunch of the flavours. 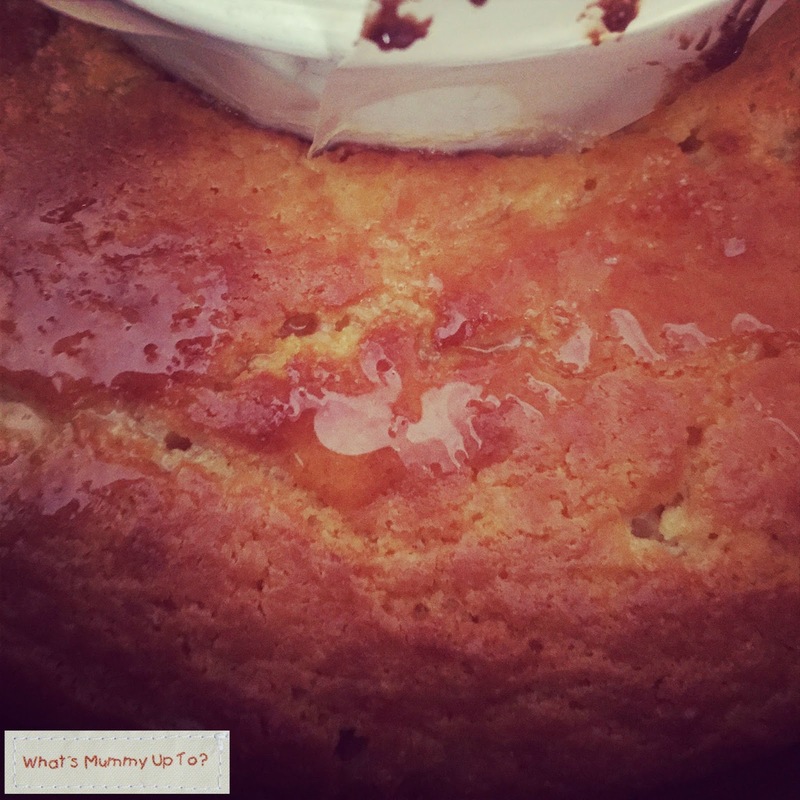 So far we've tried the Passionfruit (definitely the favourite all-round so far), the coconut (which I absolutely loved) and the plain, which I've used in cooking and if I get my act together soon, I might even had a go with using the rest of it to make some Labna. We'll see ... I'll keep you posted!! 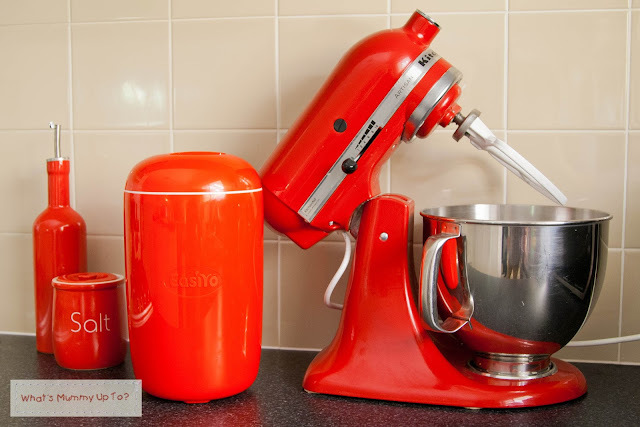 And one other thing that I like about this new EasiYo and the red-shiny-ness of it is that it absolutely matches my kitchen colour-scheme. That's definitely an incentive to keep it out on the bench for regular yoghurt making ... it's just so darn pretty! 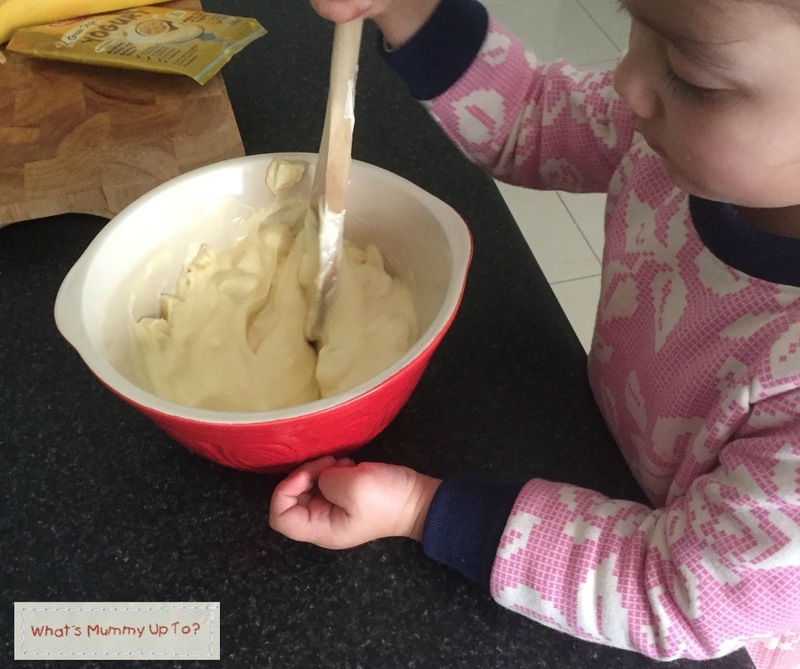 So, with all this yoghurt in the house, I thought I'd find a couple of recipes. The first was this amazing Lemon Yoghurt cake ... I posted this teaser on Instagram ... It's one of those drizzle-the-hot-lemon-syrup-over-the-hot-cake-and-watch-it-soak-in kind of cakes ... Yum. 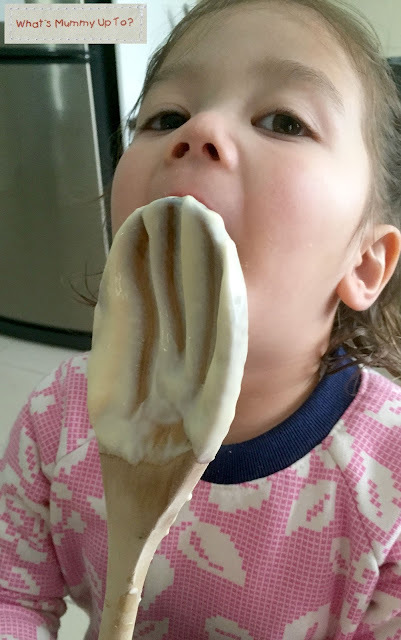 This one uses plain yoghurt! 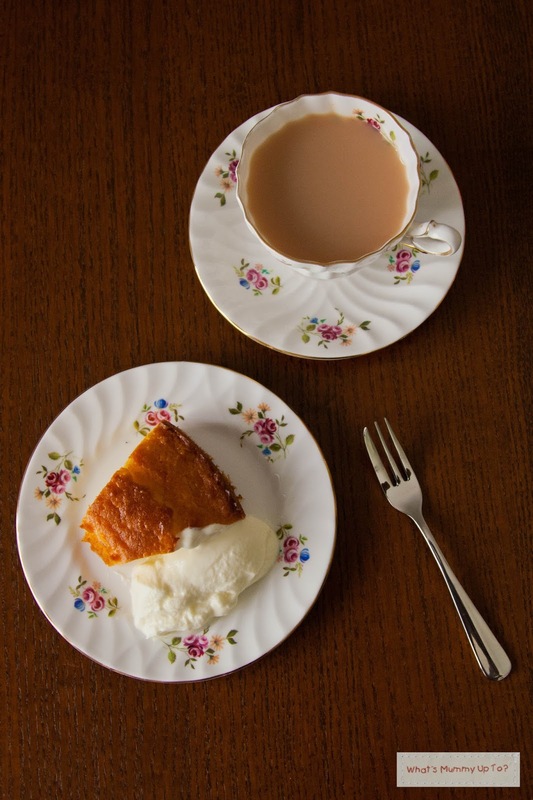 And it was a great excuse to get out my Gran's vintage cup and saucer for a slice of cake and a cuppa on a cold winter's afternoon. 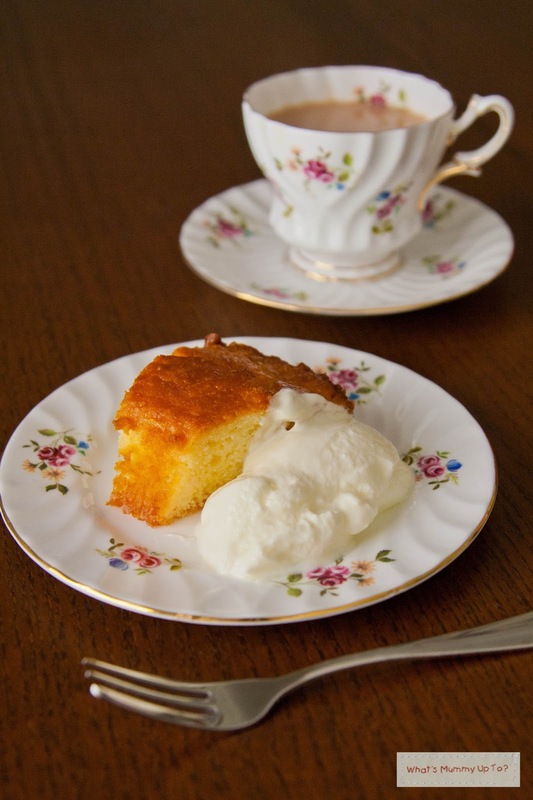 I just love a cup of tea in a real teacup ... don't you! 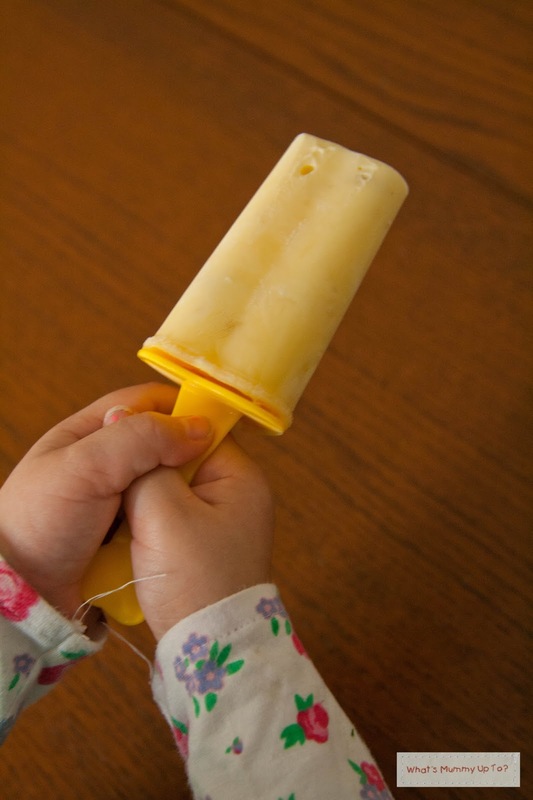 You'll also need some ice-block moulds ... we used these funky-shaped ones. Hannah told me immediately that she would be having the "love heart icecream". 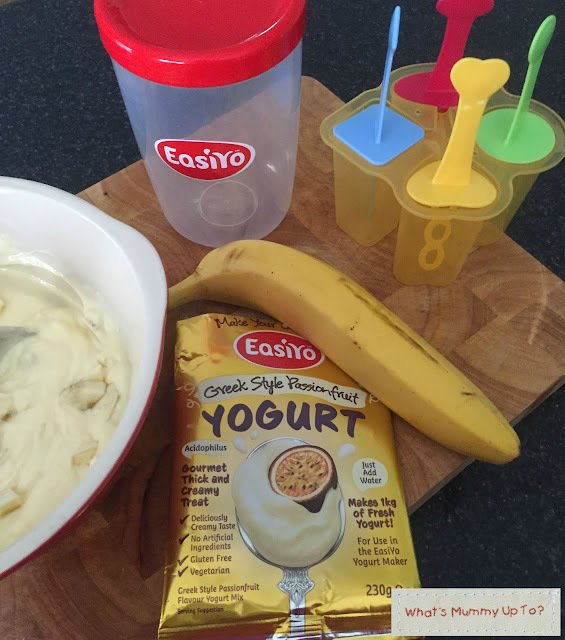 To make them, just dice your banana up into 1cm-ish sized pieces, then mix together with the yoghurt. Can't be much simpler, really! 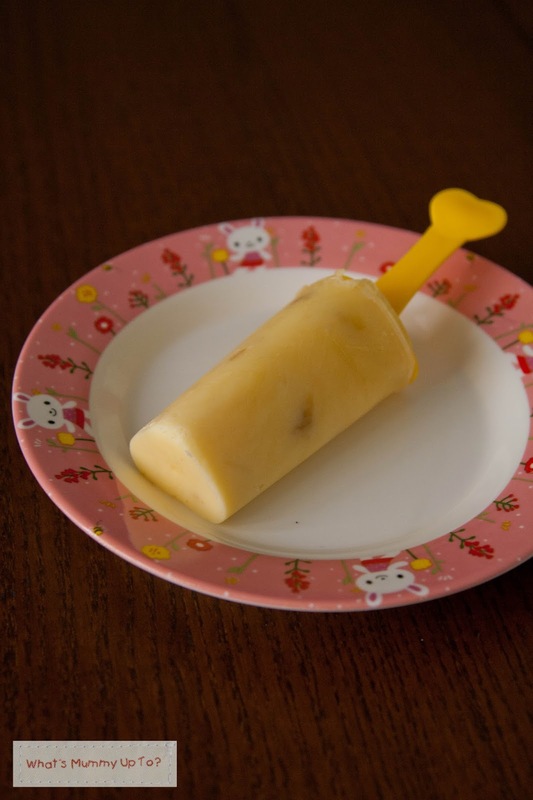 Spoon the mixture into the ice-block moulds and freeze! Oh, and don't forget to lick the spoon! These are really tasty (I ate the pink one!). The frozen banana almost disappears and the passionfruit yoghurt has such an amazing passion-fruity flavour ... makes me long for summer! 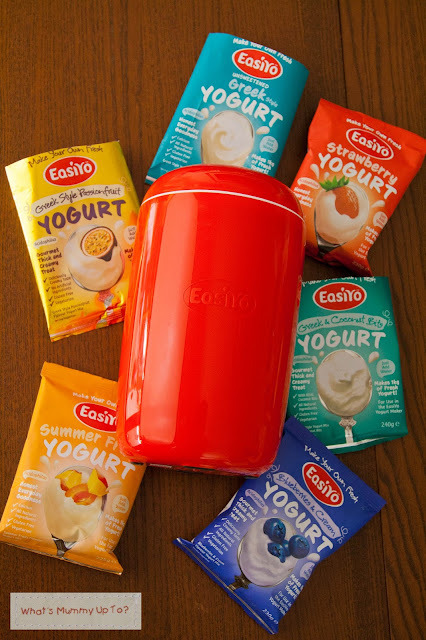 So, we've had a ball product testing the new EasiYo maker. I really would recommend it. It's quick and easy. 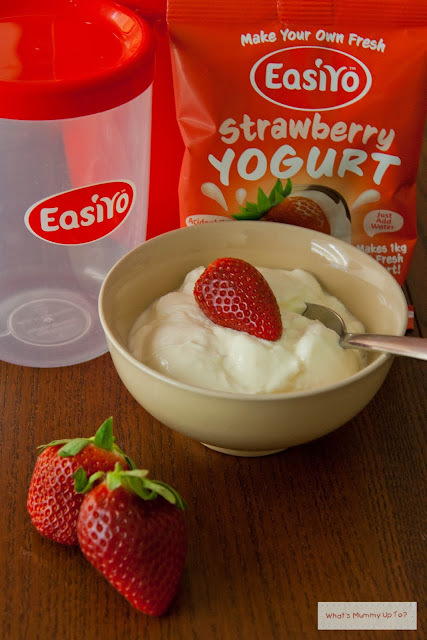 The yoghurt is thick, creamy, and tasty, not to mention it is free from artificial ingredients, gluten-free, and suitable for vegetarians. The new EasioYo is available in Australia from Big W, Woolworths, IGA and online for $24.99 (RRP) and the yoghurt sachets for 1kg fresh yoghurt are available from $4.50. So, it's not expensive either. I also think these would make a great gift!